Here is my latest acquisition for warmth. 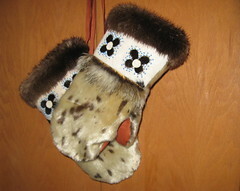 A pair of seal fur mittens with mink and wolverine trim. I bought these from a crafter who flew in from Goodnews Bay to sell in Bethel. Almost every day we get an “all call” to tell us someone is in the foyer selling art or other goods. This is the closet thing we have to a mall. The weather has turned cold again. So I am happy to have my new boots and mittens ready. Now all we need is a little more snow!